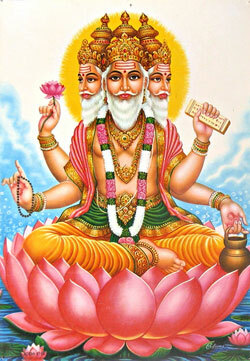 Within the Hindu trinity of Brahma, Vishnu and Shiva, Brahma is the creator. Brahma grew in a lotus out of the navel of the sleeping Vishnu. The daily alternation of light and dark is attributed to the activity of Brahma. Brahma has four heads, but used to have five. The four extra heads appeared when Gayatri was very ashamed with Brahma’s love for her and tried to escape from his gaze. The tremendous tapas that Brahma had practiced for the purpose of creation were entirely annihilated through his desire to unite with his daughter. One head was lost later when Brahma lied to Vishnu and thus caused Shiva to become very angry. The four Veda’s are said to have sprung from his heads. In the Life of Ganga, Brahma advised Bhagirathi to ask the help of Shiva in containing the power of Ganga (goddess of the Ganges River).